· The ability to respond to a survey, among others. Given the shortness of time, it was clear to us that we needed to “generate” the app (rather than “develop” it). Hence, PowerApps was the obvious choice. Furthermore, the ability to leverage Azure AD (so we don’t have to worry about auth) and the out of the box support for SharePoint, further reinforced our initial design decision. Next, we conducted a detailed design session to map all the data we needed with the PowerApps data sources. We realized that ideally we needed various SharePoint list types including DocumentLibrary, Survey, Events and Picture Library. However, the PowerApps designer currently only supports a custom library out of the box. So we knew we wanted to leverage the customs lists to the extent we could, and of course, we had the fallback of calling a custom API if needed. As you know, Windows Phone is not yet supported, but the event organizers were ready to move forward with the support for Windows Store App, iOS, Android and a Web Browser. 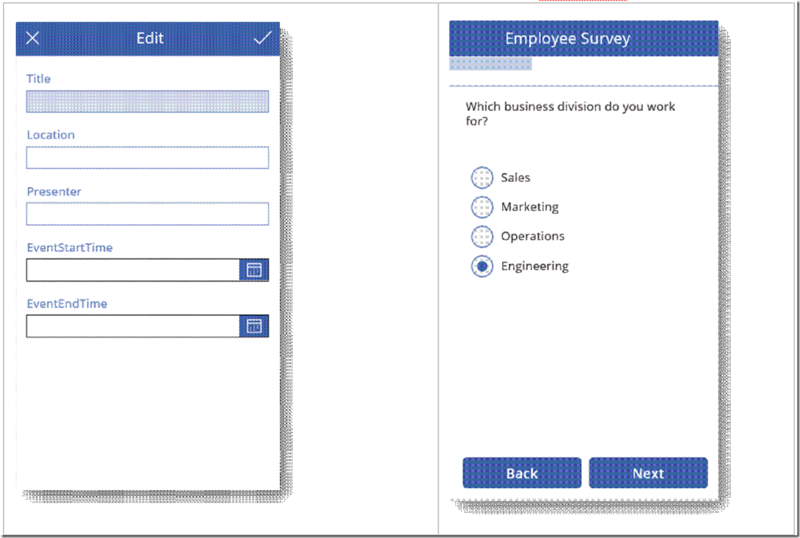 We created a sandbox O365 subscription and then created a bunch of custom lists to capture the details associated with events, documents, pictures and survey data. The Integration with Outlook Web and Desktop required an additional step. We wanted users to be able to click on an event and have that event added to their respective calendar. Since the Office 365 connection does not yet support calendars, we achieved this by calling the O365 Calendar API via the Flow. Microsoft Flow allows for creating workflows that can connect one of more APIs. Workflows can be executed in response to an event or a trigger. Flow is the default choice in PowerApps to integrate with external services or to start a workflow. We created a Flow that gets triggered when a user clicks on the “Add to Calendar” button. 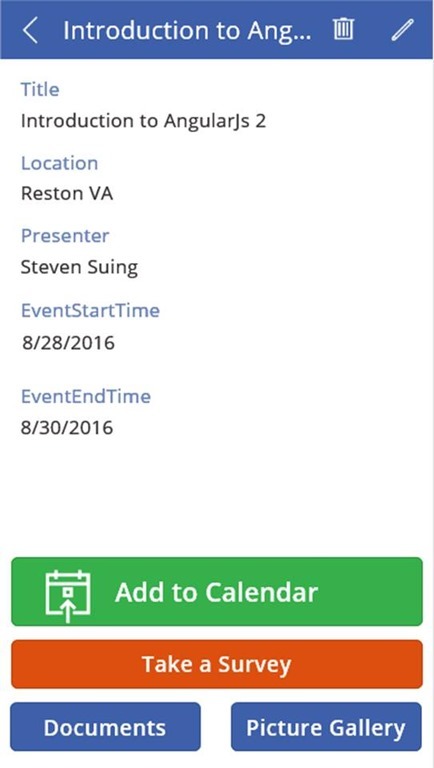 In turn, it calls the Calendar API by providing the event details as parameters. With the basic functionality done, we turned our focus to more advanced use cases. Specifically, we delved deeper into the survey capability. Our first approach was to use Flow to submit the survey data to the custom list. However, we ran into an issue with logic expression. We reported this issue to the PowerApps team and they jumped into help (as of writing of this blog post the fix is already in production – a testament to responsiveness of the team, even during the preview phase). In the meantime, we also realized that storing the survey data in a custom list was not ideal from a data aggregation standpoint. So we decided to build the survey capability using the Azure Storage Table. Essentially, we created a custom API that wrapped the Azure Storage Table. Then we added a PowerApps connection to the custom API. Finally, we wired the survey submit button to the custom API (shown in the adjacent picture). The final phase was to provision the SharePoint content types and custom lists, populate the lists with appropriate data and publish the app within the Microsoft organization – making it available to all employees attending the sales summit. 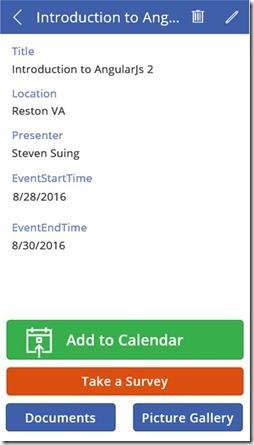 As you see from the brief description above, PowerApps + Flow allowed us to “generate” the event app in matter of days. The ability to host all the event data within SharePoint made the initial data entry (not to mention the subsequent updates) wonderfully easy. We did not have to worry about authentication, app store publication or distribution since the app was available to users within the organization.